If you did a previous level, you can choose the same activity for Gold, but you need to show development in it. It’s best to try something new! You’ll spend 12 months on your Volunteering section. For Physical and Skills you must spend 12 months on one and six months on the other – you decide which way round you do it. 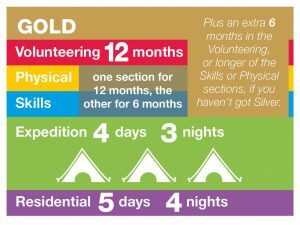 The big difference at Gold is you’ll also do a Residential section – staying away from home for five days and four nights doing a shared activity with people you don’t know. It’s great fun and a real chance to do something different! For Gold, you’ll need to do your programme for at least 12 months if you’ve achieved your Silver Award, or 18 months if you’ve started at Gold level without doing your Silver – even if you’ve done Bronze. Please see either Mr Neill or Mr Mulholland if you would like to register to do your Gold Award.